What does a transformative vision of education look like? I can think of no better example than Ubiquity University. I recently came across this organization and was surprised, relieved, and validated. Surprised that this organization has acted on some of the most vexing issues facing higher education; relieved that they have given those of us who are critical of academia a viable alternative; and validated that my ongoing focus on “vision” and paradigm-shifting change has been addressed. Here are some of the qualities in their wonderful program. Ubiquity University is not focused on students obtaining degrees, but rather, “in the revolution transforming education, the focus is increasingly on the student and the skills they need in a radically changing world. This reality is what education must address.” (From Ubiquity U. website—see link below). Many programs say they are student-centered, but most are instead reflective of Tagg’s “instructional paradigm.” (Link to previous post on topic). To build a program from the ground up, based on real student needs rather than antiquated disciplines reflecting the instructor’s interests or static program requirements, is a revolutionary beginning. Ubiquity University, focused on competency and skills needed in today’s society, has long been talked about but rarely actualized. ” . . . modular, competency-based experiences that foster collaborative creativity and develop skills directly relevant to their lives.” (From Ubiquity U. website—link below). A modular approach allows for flexible curricular adoption and change while providing the potential for students to structure a program of learning best suited to them. A competency-based curriculum builds usable student skills that are taught and demonstrated in authentic contexts. One of the most critical aspects of student engagement is for them to see the importance of what they are learning as meaningful to their actual lives. The traditional curriculum, beginning with introductory classes in the sciences and social sciences, often seem removed from a student’s frame of reference. If that is the case, it is hard to obtain student buy-in and their full effort. Ubiquity’s courses are quite different. They provide an inter-disciplinary, global view, with subjects that are topical and relevant to the challenges we all face today. The course titles tell the story. Ubiquity’s learning model is well thought out and “holistic” in the best sense of the term. Like traditional programs, they offer study in the form of lectures, tasks, research and discussions. Just from my initial impression of their literature and website, I would argue that even these normal activities are better integrated into a meaningful whole than the typical college offerings. The traditional model in academia stops with these study modalities. What sets this model apart is the equal emphasis on a student’s personal development along with their becoming a change agent in the world arena. I’ve always thought that life skills, not merely academic ones, were important to teach in college and K-12. This would include working to solve real world problems, the ability to work with others in groups and lead groups, and building personal traits like perseverance, self-discipline and self-reflection. 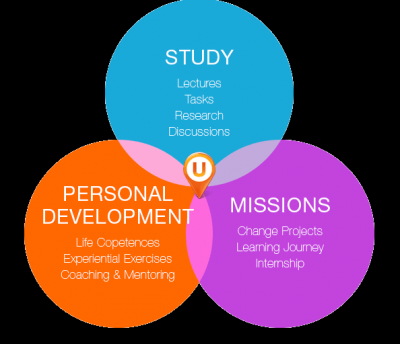 Through coaching/mentoring and experiential learning, Ubiquity U. addresses this critical aspect of real learning for students. But Ubiquity goes even further in their model. Under the moniker of “Missions,” they foster independent student thinking about their impact in the world and creating a personal vision for their lives. This is accomplished via innovative learning journeys, internships and “change projects” that personalize learning and create real meaning for students to incorporate into their lives immediately. Through the holistic learning model that Ubiquity offers, students can better see the importance — and the greater context — of their learning in their lives. Whether Ubiquity’s program (which just recently got off the ground) can be scaled or replicated at other institutions remains to be seen. At Ubiquity University, however, it looks as though students receive a beautiful learning experience that may point to a new vision of what is possible for higher education. Barr, Robert B. and Tagg, John, “From Teaching to Learning: A New Paradigm for Undergraduate Education,” Change, November/December 1995. Tagg, John, (2003) The Learning Paradigm College, Jossey Bass, San Francisco, CA. This entry was posted in A Learning Pedagogy, Envisioning Online, Online Best Practices, Online Trends, Paradigm Shift. Bookmark the permalink. I like your writing and creativity. Most students are focus on solely focused on learning and getting degrees. thanks for sharing.